Give a carpenter a level and a plane and he’ll know what to do with them. They’re tools of his trade. However. without a knowledge base, an inexperienced person may not know how to use those tools correctly. Tire warmers are simply tools to manage tire performance and longevity. They also require a base of knowledge to use them effectively. This article reviews the basics of how tire warmers can be used as tire-management tools to help you get the most out of your tires. Chicken Hawk Racing is proud to be a supporter of professional and up-and-coming privateer racers since 1992. Do you have what it takes to be a Chicken Hawk-sponsored rider? Join the ranks of top racers. Chicken Hawk-backed racers compete in the MotoAmerica Superbike Championship, AMA Pro Flat Track, British Superbike Championship, Isle of Man TT and MotoGP World Championship paddocks, including Yoshimura Suzuki’s Roger Hayden & Toni Elias; 2016 MotoAmerica KTM RC 390 Cup Champion, Brandon Paasch; M4 SportbikeTrackGear.com Suzuki; TOBC Racing; 2016 AMA Pro Flat Track Champion, Bryan Smith; 3X AMA Supermoto Champion, Gage Mcallister; Buildbase BMW Motorrad’s Isle of Man TT Winner, Michael Dunlop; BSB Superstock 1000 Champion, Taylor MacKenzie; 2014 FIM Supersport World Champion Michael van der Mark and nearly all of the AMA Pro Flat Track GNC paddock, as well as in club racing paddocks across the USA. Chicken Hawk Racing has tire warmers to fit every budget. For track day riders our Privateer Line features a Dupont Nomex® liner, carbonized insulation and Neoprene® sides panels to retain heat; for club racers and aspiring pros we offer our Classic Line tire warmers, adding our traditional serpentine heating element, Dupont Nomex® insulation and Cordura® exterior; and for professional racers and teams we’re proud to offer our top-shelf Professional Line warmers that feature our exclusive, high-density heating element – only 8mm spacing between the elements (185’ of element compared to 85’ in the Classic Line) set at 195º F. These features make it the industry’s hottest tire heater, with an additional layer of insulation and an aluminized Kevlar exterior for added heat retention. 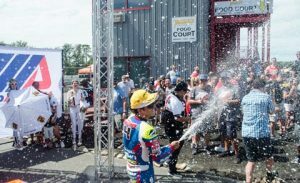 See firsthand why the podiums are filled with riders using our warmers: Champions Choose Chicken Hawk! CHR raffle winner Dan Edmondson enjoys the Prize! Dan, his fiancé and their pooch, Bradl, pose with Rich Doan of Yoshimura and David Podolsky of Chicken Hawk Racing. CHR raffle winner Dan Edmondson enjoys the Prize! 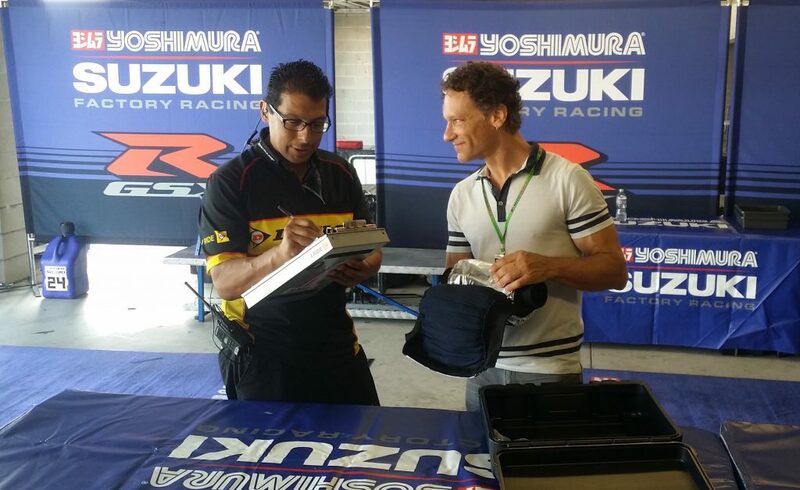 Having his name selected from the entries, Dan Edmondson smiles here with his Yoshimura branded tire warmers which were autographed by former team rider Blake Young. 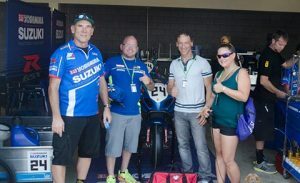 In addition to the one of a kind tire warmers, Dan and his fiancé received 3-day passes to the Moto America races at New Jersey Motorsports Park, toured the team’s race prepped tractor trailer and had a chance to meet the crew and see the Yoshimura Suzuki race bikes up close and personal. 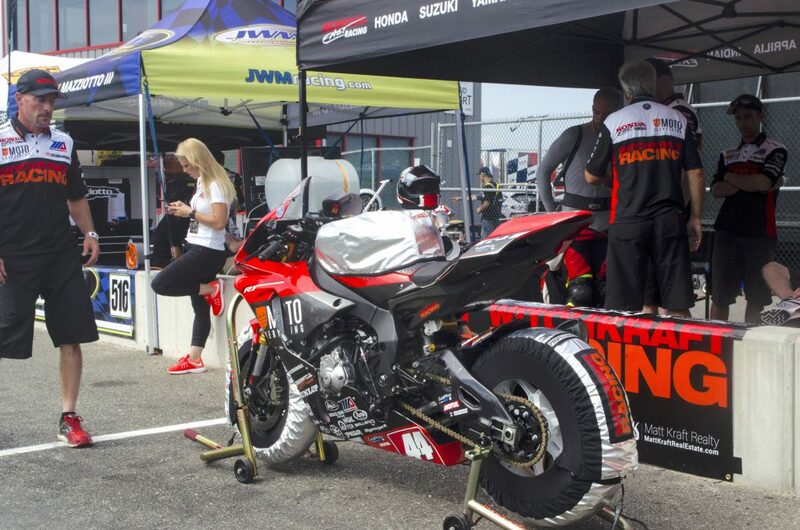 Thanks to Rich Doan of Yoshimura and Moto-America for helping make this a great raffle and race weekend!! Congratulations to Team Yoshimura who swept the races! !